Not to be confused with Foreign alliances of France. L'Alliance Française (French pronunciation: ​[aljɑ̃s fʁɑ̃sɛːz]; "French Alliance"), or AF, is an international organization that aims to promote French language and culture around the world. Created in Paris on 21 July 1883 under the name Alliance française pour la propagation de la langue nationale dans les colonies et à l'étranger (French alliance for the propagation of the national language in the colonies and abroad) — now known simply as Alliance Française — its primary concern is teaching French as a second language and is headquartered in Paris. In 2014, the Alliance has 850 centers in 137 countries, on each inhabited continent. First publication of the Alliance française in 1884. The Alliance was created in Paris on 21 July 1883 by a group including the scientist Louis Pasteur, the diplomat Ferdinand de Lesseps, the writers Jules Verne and Ernest Renan, and the publisher Armand Colin. 1,016 locations in 135 countries. The organizations outside Paris are local, independently run franchises. Each has a committee and a president. The Alliance Française brand is owned by the Paris centre. In many countries, the Alliance Française of Paris is represented by a Délégué général. The French Government also runs 150 separate French Cultural Institutes that exist to promote French language and culture. In 2005, along with the Società Dante Alighieri, the British Council, the Goethe-Institut, the Instituto Cervantes, and the Instituto Camões, the Alliance française was awarded the Prince of Asturias Award for outstanding achievements in communications and the humanities. Alliance Française de Manille, the oldest branch in the Far East, in Makati City, Philippines, extant since the 1920s. The Alliance Française Paris Ile-de-France is a Higher Private Education Institute. It is an association from the law 1901. Located in the heart of the capital, the Alliance Française Paris Ile-de-France is a genuine international meeting point where more than 11,000 students from 160 different countries come every year to learn French. It is also the oldest one since the school offers courses in Paris since 1894. The 110 faculty teachers at the Alliance Française Paris Ile-de-France are all certified in teaching French as a foreign language. 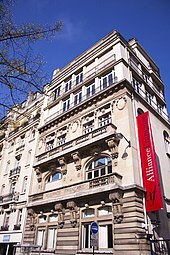 Until 2007, the year of creation of the Alliance Française Foundation, the Alliance Française Paris Ile-de-France was called "the Paris Alliance Française". It was divided into three branches: the International Relations (DRI), the School of Paris, and the Department of Human and Financial Resources (DRHF). In 2007, the DRI has become the Alliance Française Foundation, while the School and the DRHF became the Alliance Française Paris Ile-de-France. a financial agreement: the Alliance Française Paris Ile-de-France supports the Foundation financially. a teaching agreement: the Alliance Française Paris Ile-de-France supports the Alliances Françaises worldwide in their projects to professionalize their teaching and administrative staff. More than 40 missions per year are made abroad. The Alliance Française Paris Ile-de-France works with Alliances Françaises from around the world, ministries, public bodies, and also large companies, supporting them in their desire to improve their command of the language in a professional environment. It is also a training center for French language teachers. Each year, nearly 2,300 teachers across the world are trained on site or remotely, initial or continuing training. It delivers specific diplomas for French teachers such as the 'DAEFLE' (Diplôme d'Aptitude à l'Enseignement du Français Langue Étrangère), created with the 'CNED' (National Center for Distance Education) or the 'DPAFP – FLE' (Diplôme Professionnel de l'Alliance Française Paris Ile-de-France en Français Langue Étrangère), which you obtain in five months after an initial training on site. It also offers summer teaching courses for French teachers wishing to deepen and improve their knowledge. The Alliance Française Paris Ile-de-France has been awarded the FLE Quality Label, achieving top marks for each of the criteria studied by the auditors: welcome, quality of teaching, premises, school management. It is also co-founder of ALTE (Association of Language Testers in Europe), an association that includes some of the most prestigious European institutions in the field of evaluation in foreign language. Since 2010, it is the provider of the 'OFII' (French Office for Immigration and Integration) for language training of the signatories of the Contract Integration living in Paris. Alliance Française in Mindelo, São Vicente Island, Cape Verde. Alliance Française in Belo Horizonte, Brazil. Argentina there are 72 partnerships with 16,000 students forming a network is considered one of the largest and oldest in the world. In Rosario, Buenos Aires, Córdoba, Campana, Santa Fe, Mendoza. Bermuda has one Alliance Française. Bolivia has five Alliances Françaises in all the main centers of population: Cochabamba, La Paz, Santa Cruz de la Sierra, Sucre, Tarija. Brazil There are 39 Alliance Française schools in Brazil, and six partner learning centres. Out of the federation's 26 states, only seven have no schools or learning centres. Alliance Française has been in the Brazilian educational scenario for more than 130 years, since 1885. Canada has 13 Alliances Françaises in nine cities from coast to coast: Victoria, Vancouver, Calgary, Edmonton, Winnipeg, Toronto (five campuses, located in Spadina, North York, Markham, Mississauga, and Oakville), Ottawa, Moncton, and Halifax. Chile has six Alliances Françaises in six cities in Santiago, Viña del Mar, Concepción, Curicó, Antofagasta and Osorno. Colombia has more than 20 Alliances Françaises in 16 cities. Costa Rica has three Alliances Françaises, the first in Barrio Amón, in the East side of the capital San José and another two, one in La Sabana (West side of the capital) and also in Heredia, another province of Costa Rica. Cuba has three Alliances Françaises, one located in Santiago de Cuba and the other two in Havana City. Dominica has one Alliance Française, in the capital city, Roseau. Dominican Republic has 4 Alliance Françaises, one in the capital city, Santo Domingo, and others in Santiago, Mao and Monte Cristi. Ecuador has five Alliances Françaises, located in the capital city of Quito and in the cities of: Cuenca, Guayaquil, Loja and Portoviejo. Alliance Française in Quito was founded in 1953 and is the oldest of the five Alliances in Ecuador. 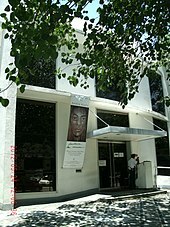 El Salvador has one Alliance Française Centre in the capital city, San Salvador. Guatemala has one Alliance Française, located in zone 13 of the capital, Guatemala City. Haiti has five Alliance Française organizations. Honduras has two Alliance Françaises, one located in Tegucigalpa and the other in San Pedro Sula. Mexico has 38 Alliance Française organizations throughout the country and twelve affiliated centers. Panama has one Alliance Française organization. Paraguay has one Alliance Française organization in Asunción. Peru has twelve Alliance Française organizations, six in the capital city, Lima and others in Trujillo, Arequipa, Cusco, Piura, Huancayo and Iquitos. Puerto Rico has one Alliance Française, located in the capital city of San Juan. Saint Lucia has one Alliance Française, located in the capital city of Castries. Trinidad and Tobago has one main centre located in the capital city, Port of Spain, with additional classes on offer in San Fernando and Tobago. The United States has 110 chapters in 45 states, including Alliance Française de Washington, Alliance Française de Chicago, Alliance Française de San Francisco, Alliance Française de Miami Metro, and The French Cultural Center in Boston. Venezuela has twelve Alliance Françaises, five in the capital city Caracas, and in several others states. An Alliance Française office in Astana, Kazakhstan. Australia has 31 Alliance Française organizations. Bangladesh has two Alliance Française organizations, in Dhaka (Alliance Française de Dhaka, three branches located in Dhanmondi, Gulshan and Uttara) and in Chittagong. Cambodia has one Alliance Française, located in Siem Reap. China has fifteen Alliance Française organizations: Beijing, Shanghai, Guangzhou, Dalian, Tianjin, Qingdao, Jinan, Chengdu, Wuhan, Chongqing, Hangzhou, Xian, and Nanjing. Hong Kong has three Alliance Française organizations, one in Wanchai, one in Jordan and another one in Shatin. Alliance Française de Hong Kong was created in 1953. India has 24 Alliances Françaises located in Ahmedabad, Bangalore, Bhopal, Chandigarh, Chennai (Alliance Française de Madras), Coimbatore, Goa, Gurgaon, Hyderabad, Indore, Jaipur, Karikal, Kolkata, Madurai, Mahé, Mumbai, New Delhi, Nashik, Pondicherry, Pune, Mysore, Tiruchirappalli, Trivandrum, Vadodara. Indonesia has four Alliances Françaises located in Medan, Balikpapan, Semarang and Denpasar. Kazakhstan has two Alliances Françaises located in Astana and Almaty. Kyrgyzstan has one Alliance Française, located in Bishkek. Malaysia has three Alliances Française centres, with two of them in Kuala Lumpur and another in George Town, Penang. Maldives has one center in capital city Malé. New Zealand has three Alliance Française organizations. The Alliance Française d'Auckland has 900 members. Pakistan has four Alliance Françaises located in Karachi (Alliance Française de Karachi), Lahore, Faisalabad and Islamabad. The Philippines has Alliance Française de Cebu located in Cebu City, and Alliance Française de Manille located in Makati City. Singapore has an Alliance Française located in Newton. South Korea has seven Alliance Française organizations: Seoul, Incheon, Daejeon, Jeonju, Gwangju, Daegu, and Busan. Sri Lanka has Alliance Française de Kotte located in Colombo, and Alliance Française de Kandy in Kandy. 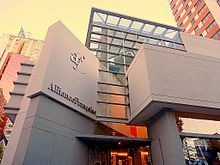 Taiwan has two Alliance Française centres in Taipei and Kaohsiung. Thailand has its main centre in Bangkok and branches in Chiang Mai, Chiang Rai, and in the city of Phuket. Uzbekistan has an Alliance Française located in capital, Tashkent. Vietnam has an Alliance Française located near the Sword Lake, the focal point of central Hanoi. Albania has four Alliance Française organization located in Elbasan, Korça, Shkodra and Tirana. Armenia has one Alliance Française organization located in Yerevan, the capital of Armenia. Belgium has one Alliance Française organization located in the capital Brussels. Croatia has five Alliance Française organizations located in Dubrovnik, Osijek, Reijeka, Osijek, and Zagreb, the capital of Croatia. Hungary has five Alliance Française organizations located in Debrecen, Győr, Miskolc, Pécs and Szeged. Iceland has one Alliance Française organization located in Reykjavik. Ireland has six Alliance Française organizations. Dublin, the capital of Ireland, is home to the third largest Alliance in Europe. There is also a location in Cork, Ireland's second city. Other locations in Ireland include Galway, Kilkenny, Limerick, and Waterford, which also has a branch in Wexford. Alliance Française de Cork also organises the Cork French Film Festival. Malta has one Alliance Francaise organization located in Floriana. Moldova has one Alliance Française organization located in Chişinău, the capital of Moldova. Monaco has one Alliance Française organization located in the Principality, at the Embassy of France in Monaco. Romania has four Alliance Française organizations located in Braşov, Constanţa, Piteşti and Ploieşti. Spain has twenty Alliance Française organizations located all over the country, promoted by the Cultural Services of the French Embassy in Spain. Sweden has 17 Alliance Française organizations throughout the country. The oldest Swedish organization was established in 1889 in Stockholm. Turkey has one Alliance Française organization located in Adana. The United Kingdom has eleven Alliance Française organizations. The first Alliance Française organization in the UK was located in London, which traces its roots back to 1884. Other locations in the British Isles include Bristol-Bath, Cambridge, Exeter, Glasgow, Jersey, Manchester, Milton-Keynes, Newcastle-upon-tyne, Oxford and York. During WWII, the London location served as the international headquarters of Alliance Française when the Paris location was closed. ^ "Homepage". Alliance Française Paris Ile-de-France. Retrieved 2015-08-11. ^ The French Language Worldwide 2014 (PDF). Paris: Nathan. ISBN 978-2-09-882654-0. Retrieved 2015-08-11 – via Francophonie.org. ^ "Institut français du Royaume-Uni | French Cultural Institute in South Kensington". Institut-francais.org.uk. Retrieved 2015-08-11. ^ "The Ghanaian Network". Alliance Française Accra. Archived from the original on 2014-12-25. Retrieved 2015-08-11. ^ "The French Touch in Kenya". Alliance Française. Archived from the original on 2015-08-11. Retrieved 2015-08-11. ^ "Home". Alliance Francaise Southern Africa. Retrieved 2015-08-11. ^ "Alliance Française in Dar es Salaam". France in Tanzania. Retrieved 2015-08-11. ^ "Home". Alliance Française Kampala. Retrieved 2015-08-11. ^ "Home". Alliance Française Buenos Aires (in Spanish). Retrieved 2018-09-24. ^ "Christmas Party 2013". L'Alliance Française des Bermudes. Archived from the original on 2014-01-09. Retrieved 2015-08-11. ^ "Actualite". Alliance Française de Bolivia (in Spanish). Archived from the original on July 7, 2015. ^ "AF in Canada". Alliance Française. General Delegation in Canada. Retrieved 2018-09-25. ^ "Home". Alianza Francesa. Retrieved 2015-08-11. ^ "Home". Alianza Francesa San José – Costa Rica. Archived from the original on 2015-08-16. Retrieved 2015-08-11. ^ Paola Cabrera Rodríguez; Ismael Francisco (11 May 2015). "Preside François Hollande inauguración de sede de Alianza Francesa y Foro empresarial". CubaDebate (in Spanish). Retrieved 2015-08-11. ^ "Alianza Francesa en Cuenca" [Alliance Française in Cuenca]. Campus France (in Spanish). ^ "Sedes Ecuador" [Venues Ecuador]. Alliance Française (in Spanish). Archived from the original on June 10, 2012. ^ "UNKNOWN". La France en Équateur (in Spanish). Archived from the original on 2016-10-11. Retrieved 2016-10-07. ^ AGN (2009-11-04). "Quinta edición de la semana francesa". El Mercurio (in Spanish). Diario El Mercurio Cuenca - Ecuador. Retrieved 2016-10-07. ^ "Inicio" [Start]. Alliance Française Guatemala (in Spanish). Retrieved 2017-01-30. ^ "Home". Alliance Française de la Jamaïque. Archived from the original on 2015-08-10. ^ "Sedes". Alliance Française Mexique (in Spanish). Retrieved 2015-08-11. ^ "Home". Alianza Francesa Managua (in Spanish). Retrieved 2015-08-11. ^ "Home". Alianza Francesa de Asunción (in Spanish). Retrieved 2018-09-24. ^ "Bienvenido a la pagina oficial de la Alianza Francesa en el Perú" [Welcome to the official website of the French Alliance in Peru]. Alianza Francesa (in Spanish). Retrieved 2018-09-24. ^ "Home". Alliance Française Eastern Caribbean – Trinidad & Tobago. Retrieved 2015-08-11. ^ "Home". Alliance Française USA Délégation générale. Retrieved 2018-02-02. ^ "Alliance Française Siem Reap". Alliance Française Siem Reap, Cambodge (in French). Retrieved 2019-04-03. ^ "Your French Language and Culture Destination in Macao". Alliance Française de Macao. Retrieved 2015-08-11. ^ "The official French culture and language center in Kuala Lumpur since 1961". Alliance Française de Kuala Lumpur. Retrieved 2015-08-11. ^ "Learn French in the most prestigious language school!". Alliance Française de Penang. Retrieved 2017-04-19. ^ "Alliance Française d'Oulan-Bator". Alliance Française d'Oulan-Bator, Mongolie (in French). Retrieved 2015-08-11. ^ "Home". Alliance Française Lahore. Aflahore.org. Retrieved 2015-08-11. ^ "Home". Alliance Française Tirana (in Albanian). Retrieved 2015-08-11. ^ "Հայաստանի Ալիանս Ֆրանսեզ" [Alliance Francis in Armenia]. Alliance Française d'Arménie (in Armenian). Retrieved 2015-08-11. ^ "Home". Alliance Française Bruxelles–Europe (in French). Retrieved 2017-04-16. ^ "Home". Alliance Française Zagreb Osijek Dubrovnik Split Reijeka (in Croatian). Retrieved 2018-09-24. ^ "Alliance Française Hongrie". Alliance Française Hongrie. Retrieved 2018-10-09. ^ "Home". Alliance Française Reykjavik (in Icelandic). Retrieved 2015-08-11. ^ "About Us". Alliance Française Dublin. Retrieved 2015-08-11. ^ "Home". Alliance Française Cork. Retrieved 2015-08-11. ^ "Welcome". Alliance Française Galway. Archived from the original on May 2, 2012. ^ "Home". Alliance Française Kilkenny. Retrieved 2015-08-11. ^ "Home". Alliance Française Limerick. Retrieved 2015-08-11. ^ "Home". Alliance Française Waterford & Wexford. Retrieved 2015-08-11. ^ "Home". Cork French Film Festival. —— "Home". 26th Cork French Film Festival 1 – 8 March 2015. Archived from the original on 2015-09-15. Retrieved 2015-08-11. ^ "Welcome". Alliance Française de Malte ~ Méditerranée. Retrieved 2015-08-11. ^ "Accueil". Alliance Française Chisinau – Moldavie (in French). Retrieved 2015-08-11. ^ "Alliance française à Monaco". Alliance Française à Monaco (in French). Retrieved 2015-08-25. ^ "Home". Alliance Française de Brașov (in Romanian). Alianta Franceză Brașov. Archived from the original on 2016-01-09. Retrieved 2015-08-11. ^ "Las af en España". Alliance Française Espagne (in Spanish). Retrieved 2015-08-11. ^ "Välkommen till Alliance française" [Welcome to Alliance Française]. Alliance Française de Suède (in Swedish). Archived from the original on 2016-07-02. Retrieved 2016-06-16. ^ "Alliance Française Adana'ya hoşgeldiniz" [Welcome to Alliance Française Adana]. Alliance Française Adana (in Turkish). Retrieved November 10, 2013. ^ "About the Alliance Française de Londres". Alliance Française de Londres. Retrieved 2015-08-11. ^ "Home". Alliance Française de Manchester. Retrieved 2015-08-11. ^ "130 years of Franco-British of friendship in London…". Alliance Française de Londres. Retrieved 2015-08-11. Bruézière, Maurice (author) L'Alliance Française, Histoire d'une Institution 1883-1983, 1983 Librairie Hachette, Paris. ISBN 2-01-009341-0. Ürményházi, Attila J. (author) Un Centenaire de Rayonnement de la Culture Française (the abridged version of the AF's history to include Une Célébration de l'Alliance Française en Tasmanie), 2004. National Library of Australia, Canberra (Australian Collection) Np 943.9052 U77.